Poinsettias are often displayed at Christmas. Here’s some in First Baptist of Donalsonville. 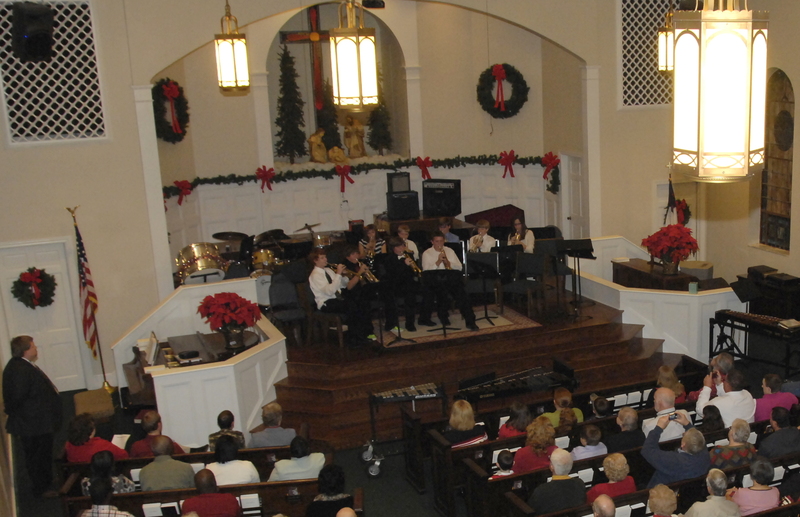 The event taking place is the recent Seminole County Concert Band Christmas Concert. More than 70,000 poinsettias (Euphorbia pulcherrima) are sold each year making this the most popular flowering plant in the United States. The poinsettia is a native of Mexico. It was named for Joel Roberts Poinsett, U.S. ambassador to Mexico, who introduced it to the states in 1828. With care, you can brighten your home with the colorful bracts (the true flowers are tiny and yellow) through the holiday season. Remember, this is a greenhouse grown plant and it is very sensitive to temperature changes. Cover with plastic, newspaper or a bag. Keep it in the car with you and the heater -not in the trunk. Bright, indirect light. Cool conditions with medium to high humidity. Keep away from doors and drafts where they may get gusts of cold air. Keep away from windows that can cause temperature changes and chills. Keep away from heating vents and fireplaces. Check daily and water whenever the soil is dry. Do not let the plant wilt, but do not water if the soil is wet. Water with room-temperature water. Water thoroughly until the water drains out, and then empty the catch tray. Do not allow the pot to sit in standing water. For foil-wrapped pots, make a hole in the bottom of the foil to allow water to drain into a catch tray. It is probably easier to discard your poinsettias when the bloom fades than to attempt to keep your plant for next year. However, many folks will want the challenge so here are some helpful hints. Follow the directions above until all danger of frost is past. Cut the stems to within 4 to 6 inches of the soil. Move the plant to a container that is 2 to 4 inches larger than the original pot. Move your plant outdoors to a bright,partially-shaded area or area that gets morning sun and afternoon shade. The location should be protected from drying winds and high reflected light. Sink the pot to the rim. Water often but reasonably. Avoid extremes of wet or dry. Fertilize with a complete houseplant fertilizer (20-20-20) according to directions. Shape as desired by pruning and/or pinching. Pinching encourages more blooms. Do not shape after Sept. 1. Turn the pot regularly to prevent rooting and ensure even growth. A quarter turn each week is desirable, but the plant will do fine with less. When night temperatures begin to fall below 60 degrees, bring your plant inside. Continue to water and fertilize. Beginning October 1, give the poinsettia 14 hours of complete continuous darkness daily. This can be done by placing the plant in a closet or covering it with a cardboard box. Any light will delay or prevent flowering. Give your plant bright light for the remaining 10 hours. When your poinsettia is in full bloom, you can discontinue the forced darkness and proceed with the maintenance instructions above. Good luck and I hope you enjoy your beautiful poinsettia and have a Merry Christmas. Please call 229-524-2326 to let us know if you will attend so we can prepare for the meal. The answer to last week’s question is Moss. 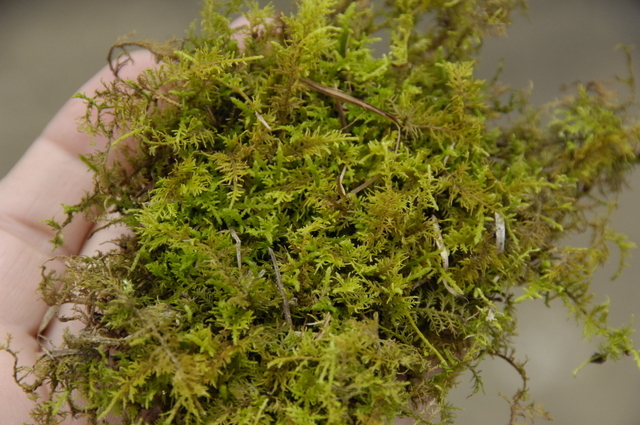 Mosses are branched, threadlike green plants that form a tangled, thick mat over the soil. They are spread by wind-blown spores and can form crusts on the soil surface that reduce air and water movement into the soil. Factors that favor moss and algae development include wet, humid conditions and compacted soils with thin turf. Moss is more common in shady areas with infertile, acidic soils and excessive thatch; algae is more common in full sun conditions and fertile soils. Here’s a link to a UGA Extension Publication concerning moss control in Turfgrass. 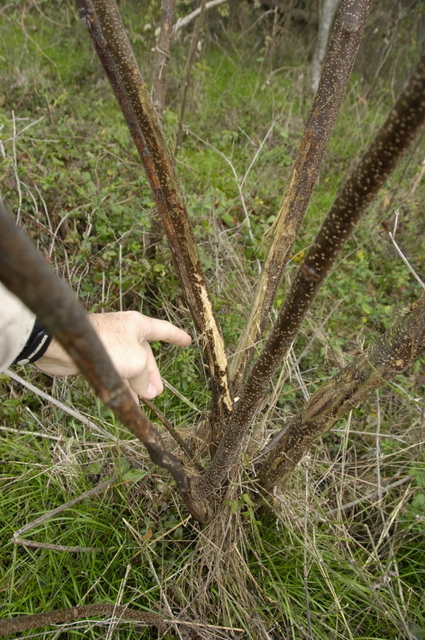 This week I want to ask about these symptoms on small trees. A farmer showed me this this week next to an old corn field. The peanut is actually not a nut at all. It’s a legume. Perhaps that’s why boiling peanuts (in the shell, in salt water), a cooking method typical of other beans, is such a popular thing to do with peanuts in the South. Americans eat over 1 million pounds of roasted peanuts every day. About 50 percent of peanuts grown are used to make peanut butter. One acre of peanuts will make 30,000 peanut butter sandwiches, while Americans eat enough peanut butter (2.4 million pounds) in a year to make more than 10 billion peanut butter and jelly sandwiches. Peanut butter is convenient, affordable (about 12 cents per serving) and nutritious. Peanuts and peanut butter are high in protein and fiber and contain 13 essential vitamins and minerals. And they’re naturally cholesterol-free and low in saturated fat. Approximately one-half of one percent of the American population has an allergy to peanuts. The number of cases has increased significantly over the past couple of years. Researchers are working on new ways to lessen the severity of peanut allergies. Peanut butter is often thought of as children’s food, but adults actually eat more of it than children. It is found in 89 percent of American homes. 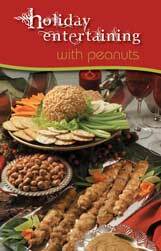 While November is peanut butter lovers’ month, March is national peanut month. Combine peanuts, sugar, syrup, and salt in a 1 ½ quart microwave safe container. Cook 8 minutes on high, stirring well after4 minutes. Stir in butter and vanilla. Microwave 2 minutes* longer on high. Add baking soda and quickly stir until light and foamy. Immediately pour onto lightly greased baking sheet; spread to ¼ – inch thickness. When cool break into pieces. Store in airtight container. • Cooking time may vary with ovens. In a large mixer bowl combine cream cheese and confectioners’ sugar; mix well. Add peanut butter and mix. Slowly add milk and mix well. Fold in whipped topping. Pour into pie shell and cover. Freeze for at least 30 minutes. Drizzle each serving with chocolate syrup. 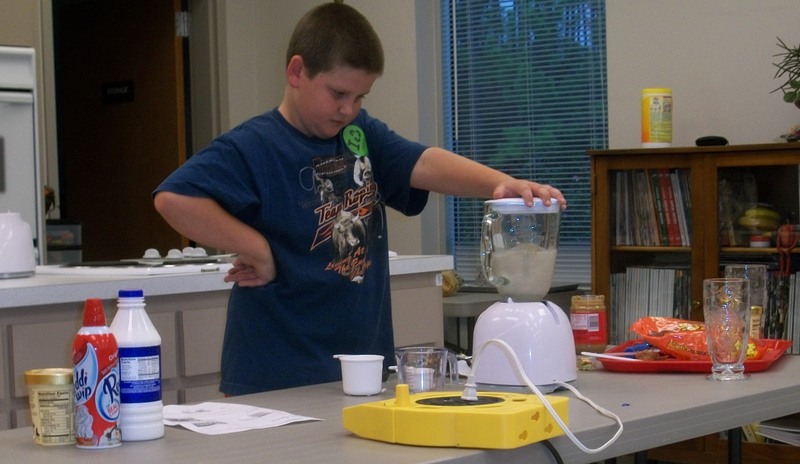 Seminole County 4H’er Payton Bishop recently competed in the “Milk Make” contest with his milkshake. He calls it “Payton’s Peanut Butter Shake”. Here’s his “not so secret anymore” recipe. Combine 1 and a half cups of vanilla Ice cream and 12 miniature peanut butter cups and a quarter cup 2% Milk, and 2 tablespoons of creamy peanut butter in a blender. Cover and process for 1 to 2 minutes or until well blended. Pour into chilled glasses. at www.ugatiftonconference.org or call 229.386.3416. Your early registration will help us plan the sponsored breakfast, breaks and lunch. Annual meeting questions may be directed to: Richey Seaton (gactn@windstream.net) or Karen Nikitopoulos (cotton@windstream.net) at the Georgia Cotton Commission office (phone) 478.988.4235. The photo on the Chattahooochee River is at the 31st Parallel and it’s on the west side of the river. So, since the river is all in Georgia then at that point 3 states come together. It’s the beginning point of the Tri-States area. 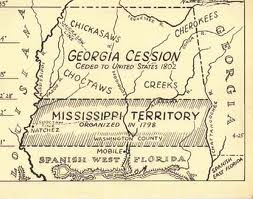 Also the 31st parallel was the bottom of the United States in Alabama when the Spain owned areas south of there. 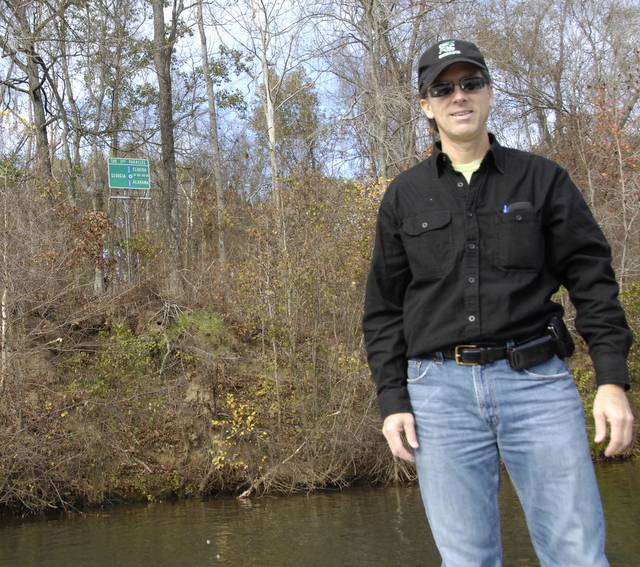 In Georgia the boundary came on down to the confluence of the Flint and Chattahoochee rivers, now under Lake Seminole. In Alabama there were mounds built every mile to mark the boundary. This week’s question is about this photo. What is this that was brought in for me to identify? The weather outlook is for slightly less rain than normal and higher temperatures for the next 3 months. Here’s a photo of irrigation running today on some small grains for cattle grazing. Here’s some info from the National Weather Service. La Niña is expected to continue through the Northern Hemisphere winter 2011-12. During December 2011 – February 2012, there is an increased chance of above-average temperatures across the south-central and southeastern U.S. below-average temperatures over the western and north-central U.S. Also, above-average precipitation is favored across the northern tier of states, excluding New England, and drier-than-average conditions are more likely across the southern tier of the U.S. In Georgia, agriculture and tourism are our state’s top two economic generators. The Georgia Agritourism Association (GAA)is the official voice of this exciting combination. Owners and operators from the state’s newest, oldest and most successful agritourism destinations will gather for an extraordinary 2012 Georgia Agritourism Conference January 5-6 in Savannah. The professional development experience and presentations by an array of speakers, business-to-business prospects, networking opportunities, trade show access and interaction with industry thought leaders will be phenomenal! Go to: www.georgia-agritourism.org/conference for details. What is the right way to say ‘pecan’? Lots of pecans have been picked up already but there are a few more out there. Here’s a photo I took this morning of some hanging in there. Prices have been very good this year. 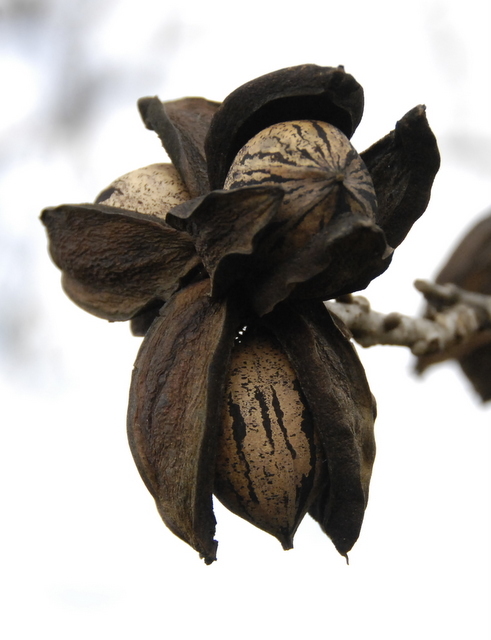 Pecans are known to be the healthiest of all tree nuts, packing more antioxidants than any other. What isn’t so certain is how the heck do you correctly pronounce it? Is it “pee-can” or “pu-cahn”? “I run into both” ways of saying it, said Lenny Wells, pecan specialist with the University of Georgia Cooperative Extension, who is writing a book on the history of North America’s only commercially grown native nut. In this episode of “In the Field,” Wells and Brad Haire, news director with UGA College of Agricultural and Environmental Sciences, try to figure it out … kinda, sorta. Watch What is the right way to say ‘pecan’?. Last week I had a photo of a cotton module in a field that was burning. 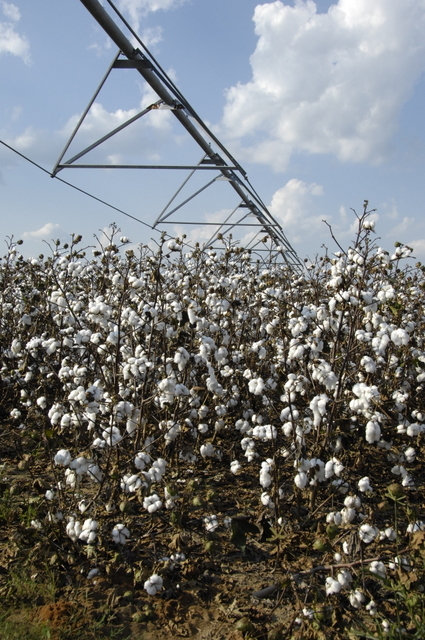 If there’s a spark during the cotton picking process we can see this partly due to the air used in moving cotton through the picker. Also, this can be a result of packing cotton that’s wet. 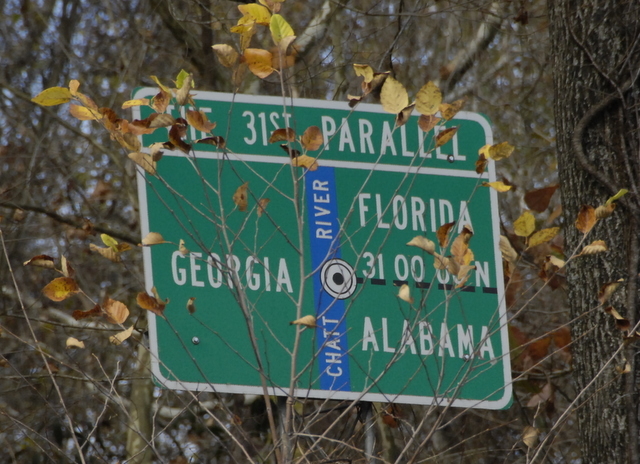 This week we went on an Office retreat/Christmas celebration on the Chattahoochee River and we went by this sign on the bank that marked the 31st parallel. What is the significance of it?